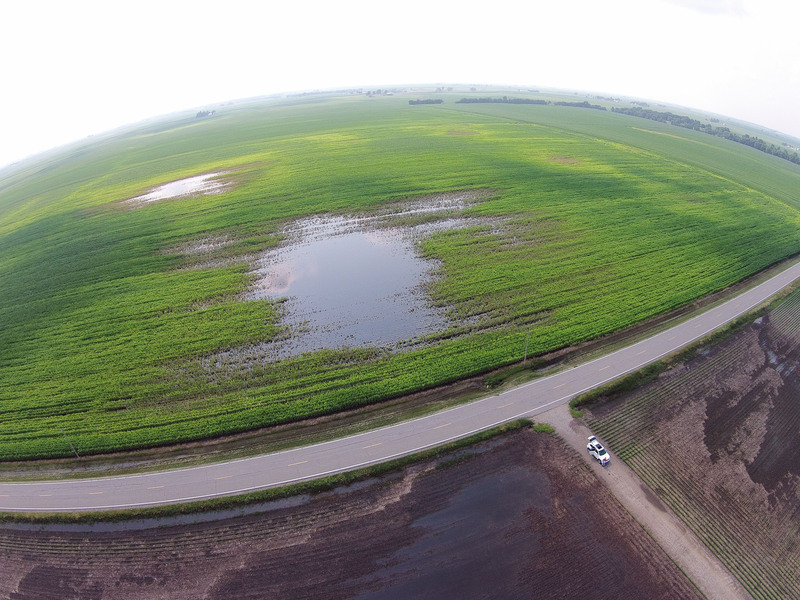 A quick UAV point of view on the impact of too much rain on soy and corn. I am not a farmer but I’ve been living among them for years now. Some of my best friends are farmers, truckers, and mechanics and conversations naturally turn to farming and crops. I’ve also been getting heavily involved in precision agriculture through UAV/drone imagery and data collection so looking at crops and taking pictures of them is becoming more a part of my daily life. Rather than produce imagery for a farmer today, I thought I’d produce some imagery for my friends to help communicate what “too much rain” looks like to a farmer. That is soy, or should be soy, in the foreground. It is currently approximating a marsh. Corn is on the other side of the road and you can start to see the scale of the impact, and why getting drainage right is so important. Again, soy in the foreground but less flooded. Some pretty healthy corn and then more corn impacted by the water. 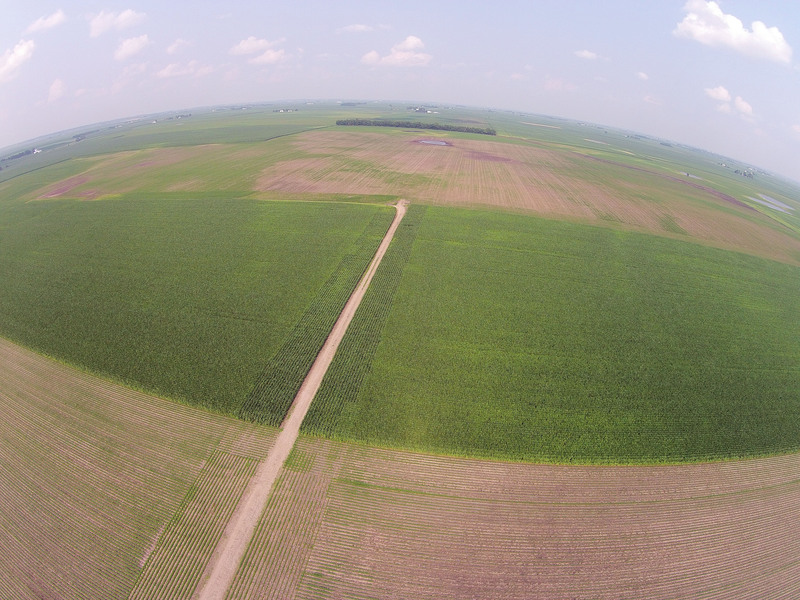 This photograph also demonstrates the value of aerial imagery – the field in the distance is not visible from ground level without driving through the standing corn closer in. What are the most popular drones for commercial use? Let’s ask the Section 333 data. 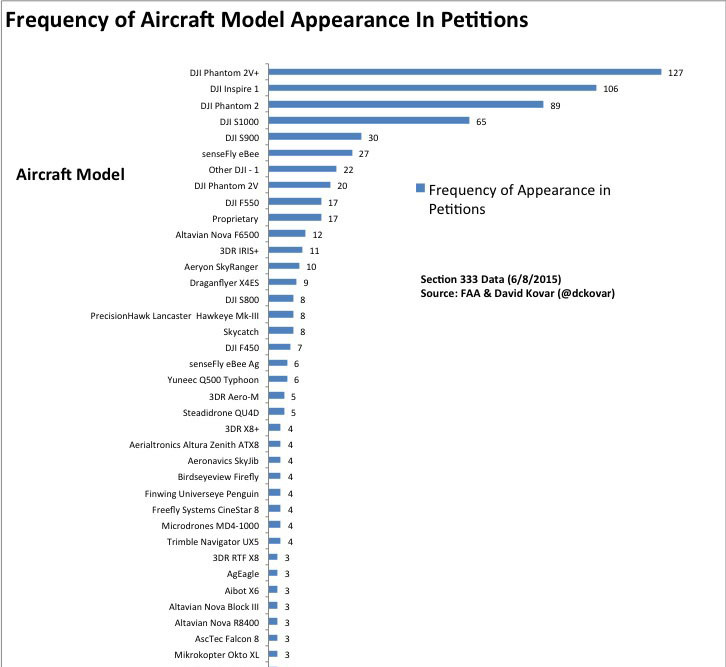 Last week we took a look at the FAA Section 333 exemption grant data to see what states had the most activity, how long the FAA took to issue grants, and what purposes were given for flying a UAV commercially. This week we want to explore what vendors and UAV models are most popular with commercial UAV operators. Keep in mind that this data only covers organizations that chose to file a 333 exemption. Also, there is some lack of clarity in the models. For example, the Skywalker Flying Wing appears in the data. I believe that this represents someone doing a custom build using the Skywalker as a base. What is the most popular UAV model used by commercial operators with a 333 exemption? 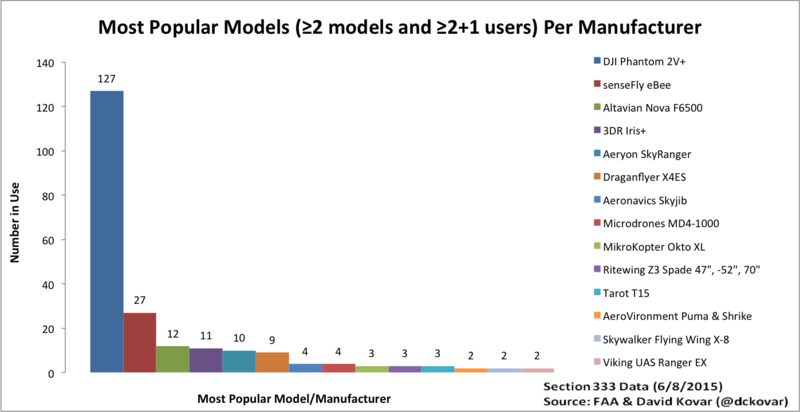 For vendors that have more than one model, which model is most popular? Where are those vendors located? If you have additional questions that might be answered by analysis of this data set, please drop us a line and we’ll try to get it answered. Also, if anyone is interested in funding additional research, we’d love to collect and analyze similar data sets from other countries. So what is the most popular UAV model used by commercial operators with a 333 exemption? The DJI Phantom 2V+. Next, for vendors that have more than one model, which model is most popular? DJI’s most popular model is the Phantom Vision 2+, Sensefly’s eBee is their most popular model, and 3DR Iris+ leads their line. An example of the type of follow on question that comes out of this analysis is this – Why is the Altavian Nova F6500 more popular than their R8400? Finally, where are those vendors located? 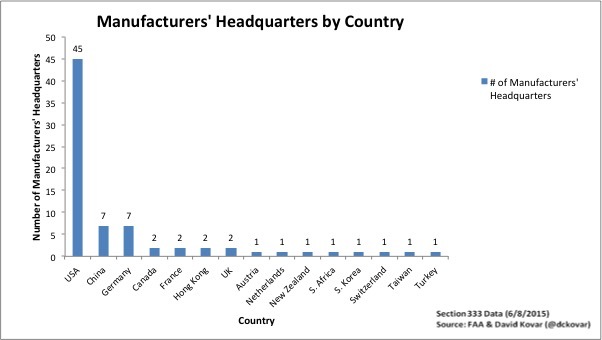 As we have been hearing for months, DJI dominates the US market for UAVs. But US vendors out number all other vendors combined. I wonder what that will look like in a year’s time? Two year’s time? I do not think that the market can sustain 50+ UAV vendors. What impact will regulation have on these figures? What vendors will be able to successfully integrate transponders, for example, into their product line. As operators start generating revenue, will they continue to use consumer grade UAVs or will they move to purpose built UAVs with more professional features? Watching the vendor space mature and settle out will be very interesting. There is a lot of uncertainty in the US UAV market due to lack of data. We do not have accurate sales data, number of hours flown, number of incidents, or even a good definition of what a UAV incident is. However, there is one really good UAV related dataset: Authorizations Granted Via Section 333 Exemptions. This is the FAA’s list of exemptions granted to allow commercial UAV operations. How many petitions/exemptions by state? What was elapsed time between filing of petition and granting of exemption? How many petitions were there for each industry/purpose? Before going forward please understand this – this post is not in any way a comment on the legality or appropriateness of the 333 process and it does not in any way imply that commercial operations without a 333 are in some way illegal or “worse” than operations with a 333 exemption.